Few days ago, Transformers fans got a small taste of what to expect inside the December 2018 issue of the Empire Magazine. Director Travis Knight has given a lengthy interview discussing his upcoming movie; Transformers: Bumblebee. TFW2005 purchased a copy of the mag to delve into the juicy details from the aforementioned interview. Though we attached the images from Empire onto this news post, we will not post the interview in its entirety. You can read below, our summary of the article. Spoiler Warning: Some may consider certain parts of the interview as spoilers. You are warned. Favorite G1 characters: Optimus Prime, Shockwave, Soundwave, Bumblebee. Though Dropkick and Shatter are new characters, they are “woven from the same fabric” as G1. Shatter’s look is inspired by G1 Nightbird (minus the nunchucks). Dropkick’s look is inspired by G1 Megatron. The director considers G1 Megatron’s design as one of the greatest designs of Transformers history. You can read the rest of the summary and take a look at the scans, after the jump. Empire Magazine December 2018 issue (out now!) can be bought from your local newspaper outlet. Exactly a month ago, we made an announcement that Paramount Pictures will be hosting their annual CinemaCon Presentation in Las Vegas on 25th April, 2018. Back then, we stated that Transformers fans should keep their expectations low for Live Action Movie Series content; since the upcoming Transformers: Bumblebee movie was still 9 months away. However, we are happy to be proven wrong on this occasion as multiple industry rumors are suggesting that the First Poster and the Teaser Trailer for Bumblebee: The Movie will be showcased at CinemaCon 2018. We do not know whether the rest of the world other than the visitors at CinemaCon will get to see the teaser trailer or the poster (the latter is more likely to be photographed though), but it is interesting to note that the trailer may debut during Paramount’s CinemaCon ‘Summer And Beyond‘ presentation on Wednesday, April 25th from 4:30PM to 6:00PM at the The Colosseum, Caesars Palace (Las Vegas). Update: Paramount and Hasbro has announced a new website for the movie. However, the site is not live yet. Once it goes online, you can get all the content from www.BumbleBeeTheMovie.com. 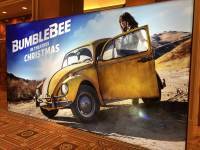 You can checkout the CinemaCon Bumblebee standee, after the jump.